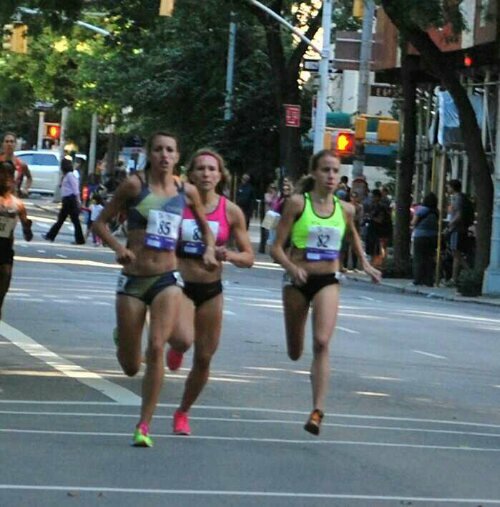 Yesterday, I ran in my first NYRR 5th Ave Road Mile Championships. Though I ran the Sylvan Beach Mile in July, I keep wanting to say that 5th Ave was my first professional race. I guess it feels that way because it was the first one away from Syracuse and built up from workouts with NJNYTC. In a way, it was my second, first post-collegiate race. But that’s a mouthful. I had to forget about my former race day routine. I never liked being to strict about it anyway because it would drive me nuts if something went wrong. For this one, I didn’t know what to expect and I wanted to be able to go with the flow. I also was home the night before with my parents and my boyfriend, Nat, which is obviously different than being at hotels when traveling with my college team and having a team bus taking us to the race. My mom made some delicious chicken, broccoli, and pesto pasta. Great pre-race meal. The next morning I got up early to wake my legs up and eat a good breakfast before making my dad and Nat leave the house at 8:15. I didn’t have to be in the city until 10:30, so 8:15 was way too early but I was nervous because you never know what could happen with traffic. Of course I got to 5th ave. at about 9:30. That was fine though because it gave me plenty of time to stretch my legs after the ride and find a Dunkin Donuts so I could stick to the one race day ritual I wasn’t willing to compromise on: coffee. I had teammates with me to show me the ropes, which is good because it was new to me. We checked in with Coach Gags and headed to the elite athlete tent where we were given our packets with numbers and instructions for the race. This tent was at the finish line, so we had to make our way a mile up 5th ave. to drop off our plastic bags with our belongings at the start before warming up in Central Park. The race itself was pretty awesome. The first quarter is flat, second slight uphill, third slight downhill, last flat. I kept reminding myself to be patient because the road can be deceiving. At the crest of the hill 800m in you could already see the finish line and I felt like I could fly so I still had to tell myself it was only half way. Then when I was within 400m of the finish I started to press. I crossed the line in second place with a new PR and all I could think was that was fun! I can’t wait to do it again. A 1-2-3 finish for NJNYTC was pretty cool as well. 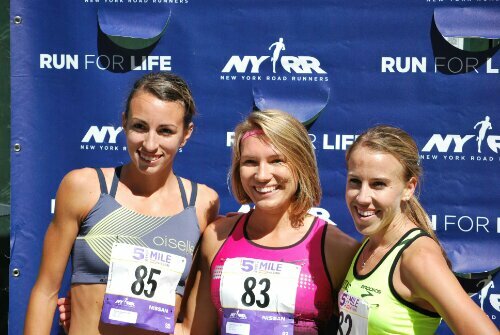 Also, big congrats to the other Oiselle birds who ran in the 5th Ave. Mile and everywhere else this weekend! I almost couldn’t keep up with all of the tweets about new PRs! Exciting stuff. The race was a great start to a great week, and hopefully great season. Today I got the keys to my new apartment and moved the first couple boxes of my stuff in! I can’t completely move in until Friday when I have my dad’s help with the furniture, but I’ll be stopping in after work all week to slowly move more boxes and do a little cleaning. Moving down there means no commuting and having teammates to run with on non-workout days. I also got a membership to the gym at Rutgers so I can use some of their facilities. I want to start swimming a couple of times a week, which should be interesting since I haven’t really done it before. I’m willing to try though because I know it’ll be good for me. Other than that, I’m just looking forward to next week and getting into the swing of things.